Question: Is there a difference between aggressive driving and road rage? Answer: There is definitely a difference between the two. Aggressive driving refers to drivers who seem to be in a great hurry and violate two or more traffic laws at the same time. For instance, an aggressive driver may speed and tailgate at the same time or speed and run a red light. Aggressive drivers are extremely dangerous and if you encounter one, you want to do whatever you can to safely get out of his or her way and let them pass. While aggressive driving can lead to a road rage situation, being an aggressive driver doesn’t necessarily mean you will become a road rager. 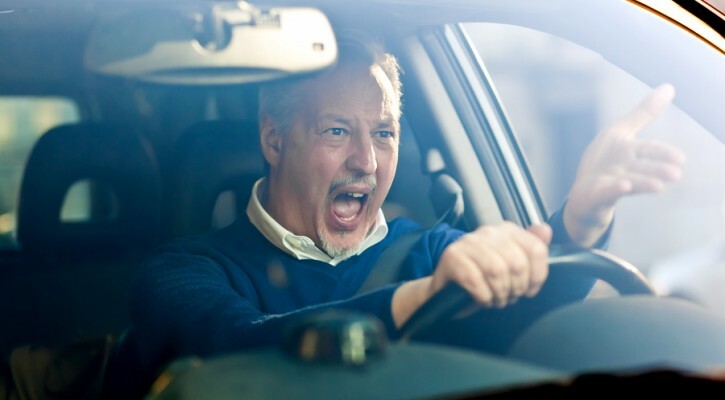 Road rage occurs when a driver, for whatever reason, becomes so angry at another driver that he or she wants to physically harm the other driver. Road rage is actually a form of temporary insanity where a driver becomes so enraged that they lose contact with reality and feel it is not only OK to harm another driver but that they can safely get away with it because they feel justified in their actions. Even normally safe drivers can allow themselves to be pushed over that psychological tipping point into a road rage situation if they feel that other drivers are taking advantage of them. Road rage situations happen on a weekly basis in the US and drivers have been killed in all 50 states in road rage incidents. Don’t speed but don’t drive slower than the speed limit either if the roadway is clear ahead. Stop at red lights and be ready to go, if the way is clear, as soon as the light turns green. Stay out of the left (passing) lane unless you are actually passing another vehicle and then move back to the right lane as soon as it is safe to do so. If someone wants to pass, help them by pulling slightly to the right and slowing a little to allow them to pass. If someone is tailgating you, let them pass by moving out of their way as soon as it is safe to do so. Don’t cut off another driver. Put down your cell phone and pay attention to the driving situation. Don’t stop your vehicle unless the traffic situation makes it impossible to move safely. Never get out of your vehicle or open your window to speak to the other driver. Call 911 immediately and tell them of your situation, make sure the other driver can see you on the phone. Don’t try to reason or argue with an enraged driver; they are past the ability to reason and they just want to harm you.